Browse: Home / Events / International Young Leaders Conference & Career Fair Is Aug. 1 at Harrisburg U! « Special Forum with Exiled Iranian Author Masih Alinejad: July 19 at Temple University Harrisburg! 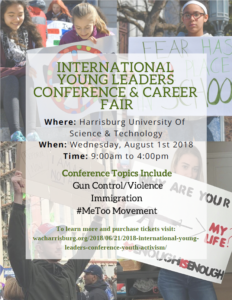 Youth & Activism is theme of 2018 International Young Leaders Conference & Career Fair. Discuss some of the most important issues facing young people today — guns, immigration, the #Me,Too movement, activism through the arts, sports and politics, and the police! Share your thoughts and learn how to make your voice heard. Enjoy lunch and interaction with globally enlightened youth — all for free! Exhibitors welcome to host table at the Career Fair! College admissions offices, political organizations, non-profits and corporations welcome!